Home Windows Windows 8 : How to Get Directly on the Desktop? 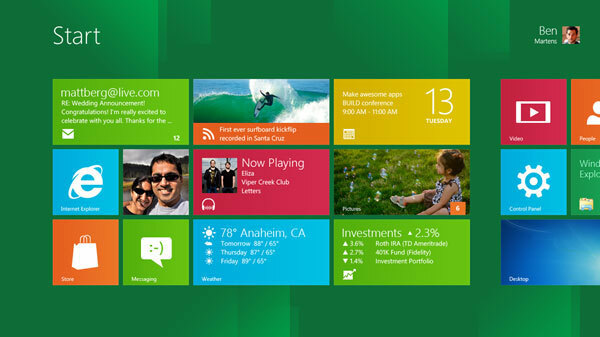 As you know, Microsoft is preparing to market a replacement for Windows 7, Windows 8, as of October 26, 2012. Fortunately, before you decide to upgrade to this new version, it is possible to get a better idea of what the real Windows 8 is. Few days ago, Windows 8 Final Version Leaked online on torrents before it’s official release. This is what I did and like every new version, get used to the changes. I must admit that Windows 8 is totally different at first glance! And the first thing you notice is that the start menu has disappeared. Fortunately, small utilities for Windows 8 Tweaks are already available for download on the web, utilities that you will greatly simplify things and allow you to set Windows 8 so that it behaves as you want. And indeed, Skip Metro Suite is one of them! Skip Metro Suite is a small utility that allows, among other things, take you to the traditional desktop rather than Windows 8 Metro interface. There is a check box to select the options and it’s good! No complicated hack. The application also allows to disable other menu bars and features. Skip Metro Suite’s primary function is to get you to the classic desktop after you log on to Windows 8. Installation is very simple, Download the tool and install it, then you reboot, log on to Windows and the Start screen briefly appears before giving way to the classic desktop. Skip Metro Suite does 4 things, all of which can be selected or unselected with a single click. First option will allow you to boot direct to the classic desktop after logging on, but it offers 3 more tweaks, all are useful for disabling various hot spots on screen. 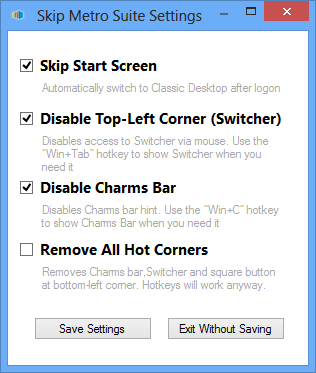 The first disables the task switcher hot spot in the top left-hand corner of the screen; the second removes the two right-hand hot spots that trigger the charms bar. And last one removes all hot corners. Skip Metro Suite 1.0.0 is one of the best tool and available for free to download for PCs running Windows 8 Release Preview or Windows 8 RTM.